Agbani Darego, Miss World 2001, marries TY Danjuma’s son – Royal Times of Nigeria. Agbani Darego, 2001 Miss World, got married over the weekend to Ishaya Danjuma, son of former defense minister, Theophilus Danjuma. The News Agency of Nigeria reports that the former beauty queen shared the news on her Instagram page with the picture showing her in a wedding dress with her partner turning their backs to the camera at the wedding. She shared the picture with the caption, “08-04-2017, #Mrs. Danjuma”, which was further confirmed by her friend Elizabeth Elohor. The couple held the wedding ceremony in Marrakesh, Morocco over the weekend. Elohor, while sharing the same picture wrote, “Congratulations, Mr. and Mrs. Danjuma @agbanidarego. May the almighty God bless your union. #mysisismarried, #beautifulcouple, #Marrakesh. 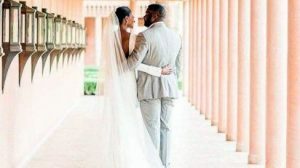 Her post revealed that the couple held the wedding ceremony in Marrakesh, Morocco over the weekend. Agbani is best known as the first native African to win Miss World when she clinched the crown in 2001 at the age of 18 after she became the Most Beautiful Girl in Nigeria that same year. A graduate of Psychology from New York University, Agbani became the first Nigerian to place among the top 10 semi-finalists, finishing seventh overall. She has judged numerous pageants, and fashion and modeling competitions including Miss World 2014, Miss England 2002, Mr. Scotland 2002, and Elite Model Look Nigeria 2012 and 2014. Agbani helms her eponymous ready-to-wear denim and leisurewear fashion company, AD by Agbani Darego which she launched in 2010.